The 1000 Islands is a hidden gem that is just 3 hours drive east of Toronto or west of Montreal. There are many people in Ontario that have heard of 1000 Islands but don't know what they look like and what a unique location in the world it is. The Thousand Islands constitute an archipelago of 1,864 islands that straddles the Canada–US border in the Saint Lawrence River as it emerges from the northeast corner of Lake Ontario. They stretch for about 50 miles (80 km) downstream from Kingston, Ontario. The Canadian islands are in the province of Ontario and the U.S. islands in the state of New York. The 1000 Islands area is just off of the 401 highway and if you are driving by it, you really don't get a chance to see the real beauty of the area. What's neat about this area is it is at the edge of Lake Ontario which is the start of the St. Lawrency river which is one of the largest rivers in the world. There are over 20 national parks located here which is a great thing because almost all of them have docks where you can park your houseboat or any boat for that matter. If you check google maps for 1000 Islands, not only will you see how big the area is but if you look for the green islands or section of land, those are all national parks. The spring and summer of 2017 was not a kind one for residents of Ontario, Quebec and even in New York state as the spring produced a lot of rain that just didn't seem to let up. There was much flooding on the Ottawa river, St. Lawrence and Lake Ontario had record water levels not seen in 100 years. Just how bad was it in 1000 Islands? You can read our article here about some of the problems it has caused for those that have houses and cottages in the area. Overall I've seen a lot of damaged cottages and the water level was easy to notice compared to previous years. The water level looked to be about 3 feet higher than normal and that's about what has been recorded. Despite it being middle of July, the water levels haven't gone down. The irony is our first full day on the trip, we had a big storm with heavy downpour. 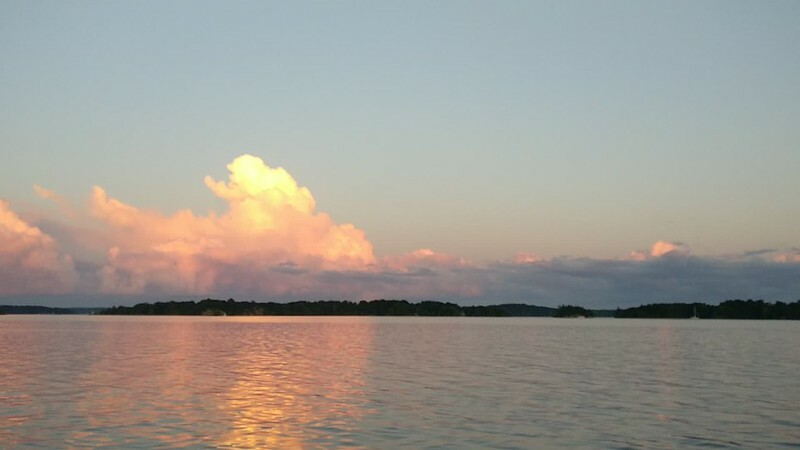 July is usually one of the busiest times to be out in the 1000 Islands as everyone is making the best use of the weather, taking time off and enjoying the summer. This was the most quiet the waterways have ever been and sometimes it felt like we were the only ones out on the water. I've heard many stories of many cottagers not being able to get to their cottage because of the high waters and their docks being severly damaged as a result. The national parks themselves were about 50% open with some of my favourite spots being closed like Camelot, half of Beaurivage, Georgina and Mulcaster. The upside of this was getting to experience a few new spots including Grenadier central, aka party central and Aubrey Island. Usually we try to secure a dock from noon to 2pm but on this trip knowing that half the docks were closed because of either damage or water levels, there had to be some compromises. The day started off by arriving at the Houseboat Holidays headquarters and being very confused. We saw a big puddle I guess we had to drive through but I didn't look ahead to realize there were no other cars in the parking lot because the whole parking lot was under water! We could see houseboats on the docks on the other side of the marina and eventually drove over to realize this was their temporary office that is to be their office for the entire season. Gordon Island I've been to before and the first time around I thought it was just an ok island but preferred going to other places like Mulcaster Island or Georgina Island. It was already late in the day leaving Houseboat Holidays headquarters. We didn't know we would pick Gordon but after seeing the docks at Beaurivage Island under water with signs saying dock closed, we knew there would be more of this. McDonald Island was full and we were hoping to get a spot there. We know Georgina would be closed so we thought we would check out Gordon and if available would take it given the time of the day. Gordon happened to have only 1 boat there and it was the only dock available as the northern one was closed. After arriving and securing our boat, we got settled in a bit. One of the neighbours on the inside of the dock decided to leave where maybe they didn't want to hang out with us and that's cool. The inside part of the dock is a lot calmer than the outside so we took that as soon as they left. After securing everything, it was finally beer o'clock and after that it was a wave of boats coming in to take the remaining docks with many more driving by hoping for a spot but being SOL. It wasn't construction holiday in Quebec but despite that, all of our neighbours were from Quebec and they all connected and I referred to them all as the Super Friends. My first time at Gordon I thought the fishing wasn't that great. Unless you had a motorboat to drive around the island, you were stuck fishing off the docks. This time around I caught everything including small mouth bass, and the catch of the day a massive catfish. The weather for the day was warm enough, not a whole lot of sun and a bit of rain. The real fun was the oncoming storm at night which came in strong at 5am and woke everyone up. Everyone was up somewhat early from the viscious thunderstorm that rolled in at 5am, by then it was just getting light out. The morning was a bit wet and made for good fishing in the morning. Since it was Saturday and our dock was full, we figured it would be the same or worse trying to find another dock if we ventured down to Grenadier Island West. Georgina Island was closed which is a popular spot. So as much as we prefer to hop on a new island every day, we have a full 7 days on the houseboat and Gordon was suprisingly nicer the 2nd time around. Today's weather got a bit sunny before noon but for the rest of the day it was a bit dark and cloudy. When the sun came out, it felt like summer, otherwise our weather was cooler than average. We left Gordon somewhat earlier than normal hoping to get a spot at Grenadier Island West knowing that if we didn't, we would have to anchor or hope we could get something else at Grenadier Island Central which we haven't been before. From Gordon to Grenadier Island we saw enough cottages that clearly had water problems. No matter where you went, you could always see something that was damaged. Just before Georgina on some private islands you would see big signs saying "No Wake" with many docks completely flooded. Grenadier Island West is one of my favourite spots in the 1000 Islands. It's where I caught a good sized large mouth bass and the place usually gets some decent sunsets. From Gordon to Grenadier was maybe around 2 hours to get there but we left somewhat early. When we arrived, one of the docks was closed while the other one was completely full. We anchored in the bay and I got out my inflatable dingy and paddled over to ask if anybody was leaving at all. Sure enough we had 2 people leave and it was a chance to score a spot. We were glad we left at the time we did because just getting into the bay it was getting windy and trying to get onto the dock was extremely difficult. After getting settled in, it was beer o'clock and time to walk around the short path of the island and plan some fishing as well. It was still mostly a dark day but got a few hours of sun in the afternoon. Since it was just Monday we thought it would be good to stay in the same spot again, not knowing if we would need to find another place and since half the docks were closed, we assumed that would be one of our best spots so best to enjoy another day of it. When it's not cloudy, the sunsets and sunrises in this area are spectacular. It gets fairly bright in the morning and it's a great bay for fishing that doesn't get too deep and has weeds everywhere. In the centre of the bay there are always some big fish splashing in the water which they do that on purpose to tease you. The day later got cloudy and it was another patchy day of some sun here and there but at least in the evening things calmed down and we had some better weather. Highlight of the day had to be the wet drone that wasn't supposed to go IN the water but did anyways. It's a very long story but a drone plus a drone raft = ultra sensitive to any slight breeze and you lose control of your drone. End of story. Finally a sunny day! The plan for the day was to go to a new spot in Grenadier Island Central but go all the length of the island to have a look at Singer Castle. Singer Castle itself is a very stylish castle and it's one I prefer over Boldt Castle. It was the first time checking it out and worth the effort. Just being out on the water was a lot of exposure to sun. The plan after was follow the map to get to Central which we did and when we arrived, we realized what a nice spot it was that we had been missing out on all these years. We learned this place sometimes has the nicknmame of party central. It's got a large number of docks where we were the 2nd boat to secure a spot. After we did, the Quebec invasion followed with the exception of a few others. It's unfortunate that we only discovered this place and probably won't have another night to be here given that we'll want to start to make our way closer to HQ. Either way the day was sunny and everyone got burnt. There was a small beach near the docks and Roxy had a chance to go in the water after her ball which is probably her favourite activity to do. On the island itself, there is a map showing where you can go to find all sorts of amenities and it seems like there is a lot of walking you could do. There are a lot of fire pits and even saw a delicious rabbit that was hanging out. For fishing you can tell the area is a hot spot although anyone doing fishing here were mainly going after perch at the docks. It's a sad day leaving Grenadier Island Central but was able to get some good fishing in on the morning. I caught a good sized small mouth bass and decided I didn't feel up for cleaning him for a meal so back in the water he went. It was a sunny morning and the water was very flat and reflective. After doing a bunch of fishing I was in the inflatable raft and Roxy likes to hang out in the raft as she is a boating dog. Today will be a busy day as the itinerary is to go to Boldt Castle, then head to the gas station to get more worms, extra food and of course gas then the plan is to head to McDonald island and take that as the 2nd last stop. Heading over to Boldt Castle we took a different path closer to the shipping channels and we could see more cottages that looked completely destroyed. That is they were slanted so badly that it looked like the whole thing had to be rebuilt. 3 feet of water is quite the difference where these houses and cottages aren't used to. Bold Castle was nice although it supposedly just opened under a week ago. You can see the docks are mostly under water but it looks like they made some extensions to be able to take on boats and tourists. The gas station wasn't fun as it was a windy day with a lot of houseboats lined up to come in. The water is very noticeable there with the water going right up to the building. It didn't help that as we were leaving the station to dock at the side, we had a guy trying to help and this old bossy lady that kept barking out orders. She was on one of the other houseboats and the other guy that works at the marina I think was ignoring her. We got the boat secured to the dock and I was controlling the rope and this lady did a bad job of trying the back part of the boat down and when I adjusted it, she was telling me how not to hold the rope and I'd fall in, I told her sternly that no I won't and she said ok and walked away. Just a reminder you'll run into some annoying people on any trip! At this point the day has been long enough so we want to get going to our final stop for beer o'clock and make our way for McDonald which is an island we haven't been to yet. Of course as soon as we get close, we see a houseboat darting for one of the docks which turned out to be the last dock. We missed it but literally 30 seconds so next options are Beaurivage, Aubrey and Mermaid Island. Aubrey looked full and it's an island we wanted to visit. Mermaid is a small island but it has a deep dock that is good for sailboats. When we do get in, Mermaid is quiet with only one other boat and the weather at this point is so so. Has been a more overcast day and after tying up for the day, it's beer o'clock. Even Mermaid island, the docks are open but the island was closed. There isn't much to see on the island other than a toilet. In the evening had a bit of rain so meant a chance to get some fishing done. I caught more perch, bass and a few catfish. The neighbours that pulled up had one of the nicest boats I've seen on the water and were a nice couple where we chatted about how the people on the planet are so fucked up that there's no recovering. Hopefully were wrong but until then, there is always beer. This is our last day and the morning starts off with no more fresh water and our toilets being full. We make an early trek to head back to HQ where we get our water and get the holding tank drained. When we head back were hoping for any spots to open up on Aubrey or McDonald so when we do get back, a houseboat just leaves a spot on Aubrey so we quickly aim in to take it. It's a bit windy and we decide to take the outside dock so we don't have a risk of hitting a sailboat. Of course deja vu happens all over again and we have one of these other boaters trying to help but is screaming orders to turn and then to stop for hitting the dock. Just a note: houseboats can catch wind fairly easily and one moment you are good and the next moment you are off and have to retreat. Also you can't just slam the boat into reverse on the spot so yes it's a slow process of neutral, then to reverse but the captain Darrell wasn't to thrilled with this guy. 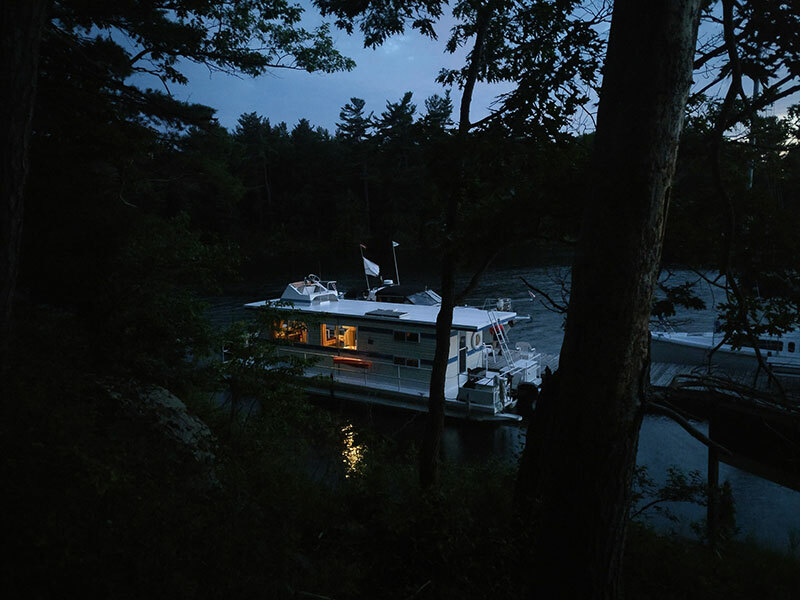 Either way, we made it and that other houseboat that left did come back but had to take another spot but we at least have a spot for the last day and that probably wasn't going to be easy to secure a spot and I don't think we wanted to do Mermaid another night. Aubrey as an island is a really nice one. Lots of paths to walk and the dock on the east side is probably the nicer spots to stay as it has a bit of a cove and can protect you from winds and waves. That other dock was completely under water with cement blocks holding it down. The island has lots of camping and no island is complete without excessive moquitoes. The fishing in this area seemed decent and I caught more bass, perch and catfish here. The guys thought they wanted one last campfire for the trip which I wasn't thrilled about knowing we would have to walk in the forrest at night, not scared of the dark but of the excessive mosquitoes. After an entire week of houseboating, you are almost tired of vacation. You could easily keep going but with this much rest and relaxation it makes you want to get back to work and plan the next trip.